Thank you Karen for investing time with James and I and going through his “Talent Dynamics” results. It was really exciting to see James understand the characteristics of the different profiles and how, by understanding his own profile, he can get more into “flow”. We have had many interesting conversations about what profiles other people we know may be and how we can best work together leveraging off each other’s strengths. I only had a few weeks of school left and I wasn’t quite sure what I wanted to do at the end of Year 12. After spending time with Karen talking about my [Talent Dynamics for Young People] profile report, I was very comfortable with how the report described me. The strengths and challenges were just so me! There was also information about what types of jobs would suit me and I’m a lot clearer now about what I want to do next year. Karen’s offer to undertake the Talent Dynamics test came at a time where I was reviewing my business and looking to expand and needing to analyze my strengths and weaknesses to further develop. The test itself was very quick and easy to complete and the report was delivered via email immediately after I completed the test. The report was comprehensive and easy to read, confirming traits and personalities that I was already aware of but also highlighting those that I hadn’t considered. The real benefit in doing the Talent Dynamics test was the discussion I had with Karen of the report contents. Karen explained my talents with such ease and confidence, prompting me to consider options that I had not thought of with my desire to expand my business. Karen also invited me to attend the 2 day seminar with Roger Hamilton in Brisbane and it is something I would highly recommend everyone attend. The end of the 2 day seminar left me with not only a concrete plan of action for the short and long term but also with a sense of positive direction that I had lacked before speaking with Karen. I took the opportunity to take the Talent Dynamics Profile Test as I am very interested in the way teams are formed and how they work in schools. From a personal perspective, I find having an understanding of my own profile with its gaps, strengths, weaknesses and thinking patterns, is also extremely useful and, to that end, have taken a range of profile tests. The Talent Dynamics Profile that I received was user-friendly. It was easy to read and the explanations made sense. What I found really useful was the concept of building flow and trust not only in oneself but within a team, with the connectivity of the profiles, as shown in the Talent Dynamics Square, making it very clear. Of particular value is the concept that there is a leader who is right for each season of a business or, in the school environment, a project. That makes perfect sense and is a concept I think is overdue for introduction to schools. I will be investigating the possibility of introducing the use of Talent Dynamics profiling in our school. volunteer positions to maximise my performance. Taking the Talent Dynamics test and receiving my profile was only the first step in this rewarding evaluation. The follow up debrief has proved to be a valuable and insightful learning curve to guide my business acumen and energies. The detailed and professional debriefing provided by Karen Bonanno has been an enlightening and informative experience that has helped me focus my energies. Karen has explored all aspects of the profile and helped me to not only identify personal strengths and challenges but to also set clear goals to maximise my potential and find solutions for elements that are inhibiting growth. Of special value for me, was not only understanding my own strengths, but discovering the types of people who will value add to my business. Thank you Karen, the Talent Dynamics profiling has been a very worthwhile experience. 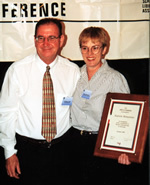 ASLA citation, awarded in recognition of contribution to teacher librarianship in Australia, October 2001. The Australian School Library Association (ASLA) is honoured to announce the winner of the ASLA Citation Award for 2001 and to commend and give recognition of services rendered to the profession. The recipient for 2001 was deemed outstanding in six of the seven fields and her work and dedication has had, and will continue to have, far reaching positive consequences for the state of teacher librarianship across Australia. Policy formulation of the ASLA policy statements co-jointly with Lyn Rushby and for the development of the ASLA website. Program implementation including Project Officer for the production of the professional development video, Steps to Success: Information Literacy; Project Officer for the development of an in-service and promotional package on the EdNA Directory Service for teacher librarians in the primary and secondary sector – EdNA Train-the-trainer manual; Project Officer for the development of an CD-ROM, Teaching Information Skills. Publication including co-editor with James Henri for The Information Literate School Community: Best Practice, numerous articles for Access, publication of the SLAQ Newsletter, conference papers – ISIS, national ASLA conferences, IASL and resources on her own website. Administration of the Association including Past President, President and Vice President between 1994 and 2000 and the many associated duties she performed to an exemplary standard whilst in these positions. Innovation reflected in the numerous projects listed and including the establishment and development of the ASLA website and involvement in the development of ASLA virtual rooms in LC_MOO to provide a virtual meeting place for members. Education including the presentation of professional development for member associations on such topics as: information literacy, use of the CD-ROM Teaching Information Skills, delivery of EdNA Train-the-trainer manual, personal and professional profile, Project Parent, teambuilding, integration of learning technologies into the curriculum; as a Facilitator for Queensland University of Technology review (1997) for Teacher Librarianship course and currently involvement in the Reference Group for QUT TL course development. Presentation of this award is a valued opportunity for her peers and colleagues to be able to acknowledge her depth and range of commitment to the profession and it is with honour that we bestow the ASLA Citation Award to Karen Bonanno, a fitting tribute to a very deserving candidate. “Thank you most sincerely for giving your valuable time on 19th September to present the very interesting session Implications for school communities in managing the transition from library to cybrary to participants at the seminar. It was a very informative and thought provoking session and appreciated by everyone who attended. “Thank you once again for the visionary keynote presented at our teacher librarian gathering last week. In comments about the day, participants described your presentation as inspirational, awesome, challenging and affirming, so take a bow! You certainly set the tone for the activities that followed and for the comments that continue via the Blackboard community established to keep the discussions of the day alive. Many participants suggested that we call on you again to speak in other forums and I will no doubt be contacting you about this possibility in the near future.